An explosive outbreak of Legionnaires’ disease (LD) was identified on 11 December 2015 in Manzanares, Ciudad Real, Spain, and was declared closed by 03 February 2016. The number of declared cases was 593 with 277 confirmed cases so that it can be considered as one of the outbreaks with highest attack rate. This rate could be attributed to the ageing of the population, among others, in addition to various risk factors and habits, and the meteorological conditions (thermal inversion) maintained in this municipality at the time. The Public Health Services succeeded in breaking the bacterial transmission. Several facilities were early identified by microbiological analysis, including a cooling tower and a decorative fountain, as possible infectious sources. Rapid analytical techniques for rapid Legionella detection and the shutdown and preventative closure of positive installations have been considered key elements in the control of this outbreak. Rapid microbiological analysis helped to the early identification of potential risk sources in a Legionnaires´ disease outbreak, reducing decision-making processes according to the actual needs of the intervention in public health and shortening the exposure of the population. Protocolized and immediate intervention in an outbreak is a crucial issue to reduce their effects on public health. For this, identification and control of the suspicious sources able to disseminate the bacteria and cause the illness is required. Rapid analytical techniques like immunomagnetic separation (IMS) method based on the whole bacterial cell detection are shown as excellent tools to investigate all the potential sources of risk. Legionnaires’ disease (LD) is a form of bacterial pneumonia caused by Legionella species. While Legionella pneumophila is the most frequently isolated species, other Legionella species have been documented as causal agent . From environmental habitats, such as surface waters, Legionella colonizes the infrastructure of water supply networks, where they proliferate under favourable growth conditions and warm temperatures (35 °C–49 °C) [2–4]. Biofilms are promoted by a poor state, inappropriate design, or the absence of proper maintenance of these systems, providing nutrients for Legionella, including organic matter, sludge, corrosion materials and protozoa. These systems can act as transmission devices becoming potential sources of infection when they are contaminated and produce aerosols. Contaminated water droplets, containing the bacteria, remain in the air and can be inhaled and deposited in the human lungs. The accepted form of transmission is the inhalation of water aerosols but aspiration has also been suggested as a way of contracting the disease [5, 6]. Several human risk factors and lifestyle habits can lead to this illness, which is presented as isolated cases or outbreaks in both nosocomial and community-acquired pneumonia scenarios . Infections caused by Legionella spp. are considered an emerging public health problem and LD outbreaks are often associated with high mortality rates . The difficulty in investigation of an LD outbreak depends on the number and variety of variables involved. Investigation raises several challenges involving a wide range of installations, which are susceptible to become sources of spreading the bacterium, by itself or in combination. LD must be considered as an emerging disease related to technical progress. Their appearance as a health issue is connected with the introduction of modern industrial processes, air-conditioning and various hot water systems, among others. In addition, number, variety, virulence, persistence, and resistance to disinfection of the bacterial strains involved in the disease must be considered. Recently, evidence on the infection of patients by more than one Legionella variant has been reported due either to the co-infection from the same environmental source or the independent infections in a very short period of time . Another variable to be considered is the weather, because meteorological factors (temperature, relative humidity, vapour pressure, among others) have been associated with a higher risk of community-acquired LD and the extent of the outbreak [10, 11]. That could be relevant to understand the survival of Legionella in water droplets and the persistence of contaminated aerosols. In this context, it is unsurprising that no source could be identified in four of the ten largest Legionnaires’ disease clusters in Europe and that no source of legionellae organisms could be found in 57% of environmental investigations . The culture method has been traditionally used to detect Legionella in a microbiological investigation. This method facilitates the characterization of the bacterial genome by sequence analysis and, if applicable, it allows establishing the relationship between strains isolated from environmental sources and those isolated from affected patients. Despite its advantages, either the overgrowth of accompanying organisms or the transition of Legionella cells into a viable but nonculturable state (VBNC) could compromise the culture results. In this VBNC state, cells are unable to form colonies on standard medium but they remain alive and infective [13, 14]. Other factors that could constrain the culture results are the loss of viability of bacteria after collection and during the sampling, the use of antibiotics in the medium, and the low concentration of legionellae organisms in the samples . All these factors are potential sources of worrying negative results despite the presence of Legionella. Finally, the time of obtaining a result (10–12 days) makes it difficult a reliable and timely monitoring of the risk. In view of the above, a new approach to Legionella spp. monitoring by using rapid detection techniques could support the early control of suspicious focus in the first hours of an outbreak. This could help to avoid unnecessary exposure of the citizens to the Legionella bacterium . 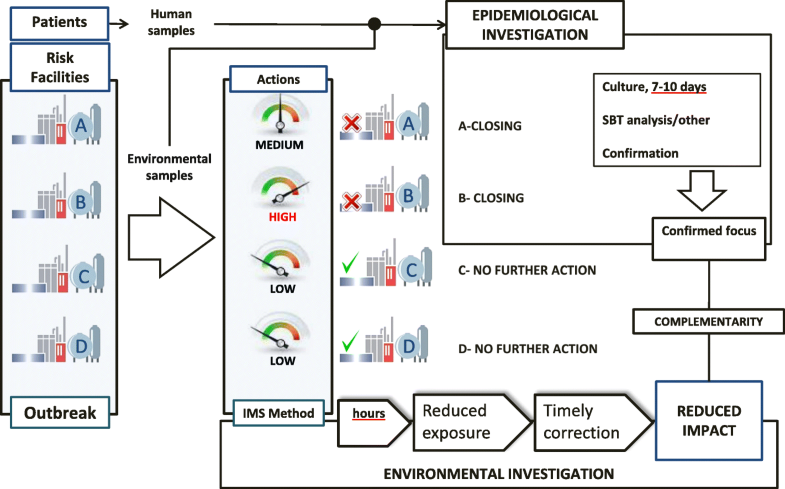 This paper specifically describes the environmental and analytical investigation made within the global investigation of an explosive outbreak occurred in December 2015 in Manzanares (Ciudad Real, Spain), on the basis of the information available in the report prepared by General Directorate of Public Health and Consumer Affairs of the Castilla-La Mancha Community Council . The approach used has focused on shortening the time needed to control the outbreak. It was decided to use a rapid method based on the immunomagnetic separation technique (IMS) and enzyme-immunoassay  since a general improvement of the recovery and detectability of Legionella spp. in environmental matrices was found in previous work . From our knowledge, the use of rapid techniques to quantifying Legionella in environmental samples provides evidence of their usefulness in the rapid intervention in cases of outbreak, as a key and precise tool for the early identification of potential sources of risk. The day the outbreak was declared, on Friday 11 December 2015, the elaboration of a directory of installations, susceptible to be classified as being at risk of dispersion and a proliferation of Legionella, was essential. First samples were taken at 08 a.m. on 12 December, due to difficulty to work in darkness on the night of 11 December 2015 and continued on December 14 and 15. These samples proceeded from cooling towers and an evaporative condenser. Taking into account the typical dirtiness of this kind of samples and its limited processing, particular with regard to the difficulty of filtration, subsequent sampling alternated different types of installations to prevent the saturation of the laboratory. Regularly water sampling was conducted until the end of the outbreak. In the course of the outbreak, 116 establishments were visited, 68 of these having 30 risk installations in operation. Simultaneously, meteorological information of the municipality was obtained from the database of the State Meteorology Agency (AEMET) in Spain, during the previous days and during the outbreak. As a general rule, instructions on the sampling procedure were sent by General Directorate of Public Health to district inspectors. The sampling began in the Industrial Park of the town of Manzanares, because possible link between some cases and installations of this Park was observed. A rapid method based on the immunomagnetic separation technique (IMS) and enzyme-immunoassay . The used IMS method, certified by the Research Institute of the Association of Official Analytical Chemist (AOAC-RI), is focused on the 1 h detection of whole cell and designed to promote the bacterial capture attending cell envelop integrity by immune-magnetic particles. This particle-bacteria binding is due to a ligand (antibodies) immobilized on the surface of the particle that binds to antigens expressed on the surface of Legionella cells. For this reason this interaction depends on the integrity of the cell envelope and it is independent of the growth ability of cell, often limited in the wild Legionella. This test has already been evaluated by Public Health laboratories by comparing this test method with q-PCR and conventional culture . Briefly, captured cells can be separated using a magnet, allowing their labelling with an antibody conjugated to an enzyme. They can be resuspended in a medium of constant composition to develop a colour reaction which depends on the quantity of immobilized and labelled Legionella. The results are reported as equivalent colony forming units (CFUeq). Conventional culture method (ISO11731). The culture method is based on the Legionella growth on a plate with a selective medium (GVPC agar, Oxoid, Madrid, Spain). The sample concentrate is previously divided into three portions, one of which is acid-washed (pH 2.2, 5 min), other is heat-treated (50 °C, 30 min) and the other is seeded without treatment. The grown colonies with morphology compatible with Legionella are confirmed and identified by biochemical, microscopic and serological tests. Cells remain alive for further studies of identification and genomic sequencing. Results, obtained in 10–12 days, are expressed as colony forming units (CFU). Additional culture testing based on Annex J of the Draft ISO/DIS 11731 was conducted when confluent or invasive microbial growth was observed on the plates, due to their epidemiological relevance to identify the strain. For this, the other 2 l of the collected samples were used. The isolated strains were identified as Legionella pneumophila or non-pneumophila species. Speciation or serogrouping (Legionella pneumophila serogroups 1 and 2–15) of isolates was done by using latex agglutination (Microkit, Spain). The identified strains were sent to National Center of Microbiology (Majadahonda, Madrid, Spain) for both phenotypic identification, according to the International Panel of Monoclonal Antibodies, and genomic identification by amplified fragment length polymorphism. A number of 323 clinical samples were sent to the National Centre of Microbiology (most of which were sputum as well as bronchial suction and cultured strains) and 26 of them, mainly sputum, were sent to Laboratory of Genetic of the University of Valencia (Valencia, Spain). On Friday 11 December, the protocol on proceedings in the event of community outbreak of Legionnaires’ disease was activated in the municipality of Manzanares (Ciudad Real, Castilla-La Mancha, Spain), with 4 declared cases having space-time association. The number of daily cases, according to date of first symptoms, grew in the following days, reaching a maximum of 75 cases on 17 December 2015. Afterwards the number of cases decreased until 25 December 2015. From this date, just a few isolated cases were declared. The cases were defined by adapting the 2012 EU/EEA case definition . Case definition was based on the following criteria: i) Living in or visiting Manzanares in the 10 days preceding the development of community-acquired pneumonia (CAP) (epidemiological criterion), ii) Pneumonia confirmed by radiology (clinical criterion), iii) A positive result in at least one of the following assays (microbiological criterion for confirmed case): culture, antigen in urine, nested Sequence-Based Typing (SBT) PCR (polymerase chain reaction), seroconversion, iv) A PCR (without sequencing) positive result (microbiological criterion for probable case). Among all the cases that met both epidemiological and clinical criteria, those that met microbiological criterion for confirmed case were defined as confirmed cases and those that met microbiological criterion for probable case were defined as probable cases. Cases that did not meet any of the microbiological criteria were defined as suspect cases. Finally, the cases that did not meet epidemiological criterion or were diagnosed with other causal agent were defined as dismissed cases. A total of 593 cases were declared from which 277 were confirmed cases, 247 were suspect cases, 33 were probable cases and 36 were dismissed cases, according to epidemiological, clinical and microbiological criteria in this outbreak. The outbreak was considered closed on Wednesday 03 February. The attack rate was 14.9/1000 inhabitants, so it could be considered as one of the known outbreaks with a higher attack rate. Interestingly, the case fatality ratio, 1.4% (4/277), is one of the lowest in the outbreaks scientifically described (Table 1). A total number of 323 clinical specimens were sent to National Centre of Microbiology. These specimens proceed from 311 patients. Of these samples the 51.39% (166/323) were low-quality samples and their cultivation was not possible. The rest of the samples were processed by culture and the 19.11% (30/157) were positive. The 36.96% (112/303) were positive by PCR method. A total of 68 strains were sequenced, 57 of them fully sequenced and 11 partially sequenced, corresponding to 12 different strains, with 10 new sequence types not listed in the European Study Group for Legionella Infections (ESGLI) database. Among them, Legionella pneumophila serogroup 1 Pontiac Philadelphia ST899 (6, 10, 14, 10, 39, 3, 20) was identified as the epidemic strain, being present in the 79.41% (54/68) of the human sequenced samples. On Saturday 12 December 2015, according to the procedure described in the Methods Section, 22 samples were taken involving cooling towers and an evaporative condenser, from facilities located at Industrial Park of Manzanares. On Sunday 13 December 2015, the first results were obtained by rapid IMS method in a period ranging 24–36 h after the samples collection. Results were negative and confirmed by culture on 24 December 2015, twelve days later. The same methodology was applied on Monday 14 December and Tuesday 15 December 2015. Twenty-two samples were collected from ten installations involving four cooling towers, two sprinkler systems, three decorative fountains and a car wash. On Monday 15 December the Laboratory of Health Sciences Institute of the Health Directorate of Castilla-La Mancha (Talavera de la Reina, Castilla-La Mancha, Spain) reported positive results by IMS method for three of these samples. Two of these samples corresponded to a decorative fountain, both in the water jet (7200 CFUeq/L) and in the tank (3300 CFUeq/L). The third positive corresponded to a cooling tower (210 CFUeq/L). Initially, the corresponding results for the culture tests were reported as inconclusive on 26 December 2015, with excessive overgrowth of interfering microbiota. The confluent growth on the plates corresponding to the three samples positive by IMS method, appeared two days after plating, revealing the impossibility of Legionella isolation. This is way the remaining 2 l were used to try the isolation of some colony, by modifying the culture method according to the guidelines set by the draft ISO/DIS 11731. Despite of this, the colonies isolation remained impossible from the sample of the decorative fountain. However, two colonies of Legionella pneumophila were obtained from the sample of the cooling tower: the first one was identified as serogroup 3 (on Wednesday 23 December 2015) and the second one as serogroup 1 (on 28 December 2015). These strains were sent to National Centre of Microbiology to be sequenced using sequenced based typing (SBT) method. The first one was identified as Legionella pneumophila serogroup 3 ST87, which did not present any coincidence with any strain isolated in human samples. The second one was identified as Legionella pneumophila serogroup 1 subgroup Pontiac Philadelphia ST899, which coincided with the 79% of the strains isolated in human samples (Fig. 1). Since 15 December 2015, water sampling continued at different risk facilities to further deepen in the outbreak. The Laboratory of the Health Science Institute reported two of these samples as positives, confirming the presence of Legionella pneumophila serogroup 1 Pontiac Philadelphia ST899 (in a concentration lower than 100 CFU/L) in the sample of an agricultural irrigation system, located on the outskirts of Manzanares, and Legionella pneumophila serogroup 8 ST1324 (in a concentration lower than 100 CFU/L) in the sample of the waste water treatment plant (WWTP) of Manzanares. Risk facilities with external emissions were submitted to a new screening over the course of January 2016, as preventative measure. Five of the eighty-four tested samples were positive by IMS method: one sample from a cooling tower in an industrial company and two samples from a car wash, all of them without confirmation by culture, and one sample of a cooling tower in a food company with positive culture result for Legionella non-pneumophila (in a concentration lower than 100 CFU/L) and finally, a hot sanitary water sample in an old people’s home with positive culture result of Legionella pneumophila serogroup 8 ST1324 (in a concentration lower than 100 CFU/L). Moreover, one sample of a car wash which gave negative by IMS method was positive later by culture method detecting Legionella non-pneumophila in a concentration lower than 100 CFU/L. A total of 116 establishments were visited from the beginning until the closure of this outbreak, identifying 68 risk installations, some of them without operation. Thirty installations were more intensively visited, involving inspection or sampling: 12 cooling towers and 1 evaporative condenser, 4 decorative fountains, 3 irrigation systems, and 4 car washes, among others. It is important to highlight that 100% of the cooling towers and evaporative condensers as well as 75% of the decorative fountains were inspected on 15 December 2015, four days after the outbreak declaration. In sum, the Laboratory of Health Sciences Institute of the Health Directorate of Castilla-La Mancha (Talavera de la Reina, Castilla-La Mancha, Spain) analyzed 215 environmental samples, 120 of them processed by culture method (positivity of 5.0%) and 95 processed by IMS method (positivity of 15.83%). Meteorological data showed that between 27 November and 26 December some atmospheric thermal inversion occurred. Wind with a very low average speed (1.8–2.2 km/h) and high humidity (92%) coincided with warmer than usual temperatures and almost without rainfall (Fig. 2). The identification of the causal focus is crucial for providing answers to questions and requirements associated with an outbreak. However, it should be noted that unequivocal identification of one or several of the installations as responsible of an outbreak depends on the concurrence of many factors. In fact, the source of infection has not been identified in many outbreaks of this kind. The scenario of the Manzanares outbreak was very complex. Firstly, because a high number of strains were identified in the patients, leaving the possibility open to suspect there could be several installations involved in the outbreak, either direct or indirect (cross-contamination). The wide variety of detected strains may be considered unusual in the context of the current literature. Secondly, because the difficulty in isolating Legionella by culture method, particularly in environmental samples, given the dirtiness of the samples taken from installations with poor or absent maintenance. In this regard, no culture results were obtained for the samples taken from a decorative fountain in a bus station, due to presence of interfering microbiota, despite their positivity by rapid IMS method. This becomes of particular importance because epidemiological models that best explain the most of the cases points to this fountain. Thirdly, because the difficulty in knowing the operation of some installations, in particular the cooling tower of a laundry company, where the epidemic strain ST899, corresponding to 79.41% (54/68) of the clinical strains, was identified. However, there is doubt about the partial or total operation of this installation during the exposure period. Fourthly, meteorological conditions would have facilitated the presence of the aerosols in the environment, which could partly explain the high number of cases by inhabitant  together with the characteristics of an aging population, concentrated in just one nucleus and having an important industrial park. From an environmental point of view, a critical issue in a legionnaires’ disease outbreak is to identify the potential sources of risk and to determine causality relating them with the focus of infection. 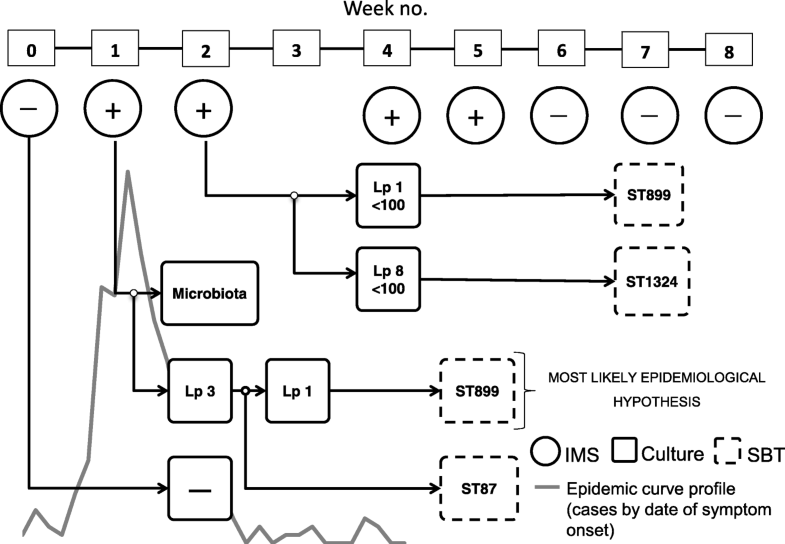 Comparison between environmental and clinical strains allows the confirmation of an installation as origin of the outbreak. The sequenced strains were obtained after their growth on a culture plate, although alternative methods exist. Furthermore, urgent intervention without falling into improvisations is required in addressing the outbreak. The reason is to achieve the identification of the suspicious focus and their precautionary closure, reducing or minimizing the effects. This intervention is provided by the use of rapid methods of Legionella detection, like the IMS method which detects cells with envelope integrity, unlike other rapid techniques like PCR. 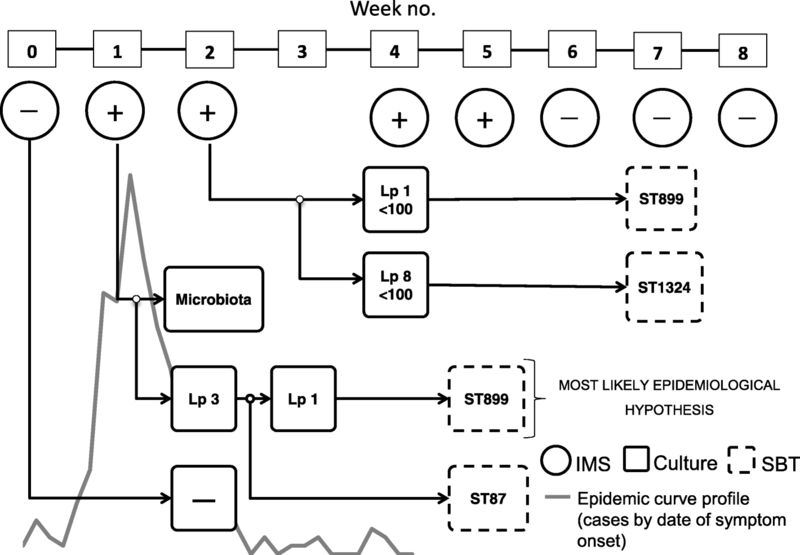 In the case of the Manzanares outbreak, this IMS rapid test was considered critical in i) allowing to locate potentially infective sources in a short time, ii) focusing the environmental research and increasing the efficacy of the inspections and sampling, iii) increasing the sample throughput, iv) rerouting the culture testing for the purpose of isolating colonies to be identified and compared to the colonies isolated from patients, and v) supporting the decision making process for the control of the outbreak (Fig. 3). In contrast the separated bacterium is not available for subsequent studies. Likewise, during sampling procedure, the owners of the facilities were informed of the obligation to stop their operation until the obtaining of analytical results. In the event of a negative result they could continue to function but always after applying water treatment. In the outbreak scenario, the culture technique should be useful to isolate the epidemic strain, but a 10 days period is considered too long. 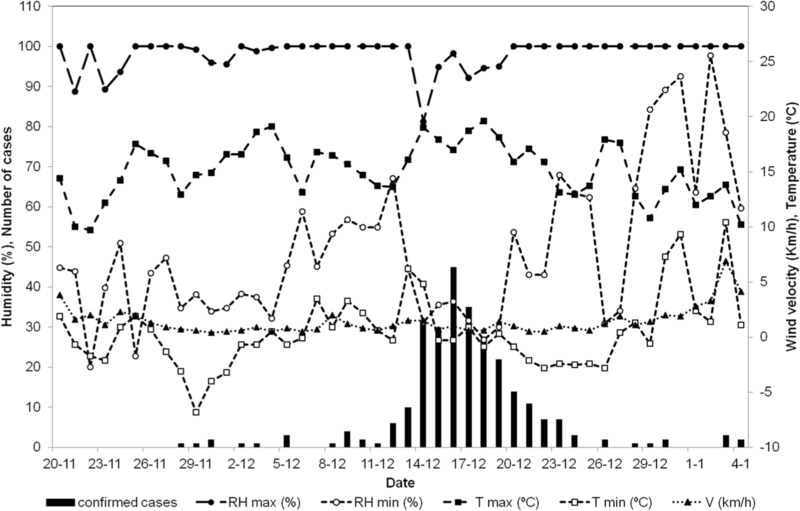 By using the IMS method, analytical results were obtained in 24–48 h, demonstrating that rapid techniques are useful in outbreak scenarios where immediate response times are required. Protocolized and immediate intervention in an outbreak is a crucial issue to reduce their effects on public health. For this, identification and control of the suspicious sources able to disseminate the bacteria and cause the illness is required. Rapid analytical techniques like IMS method based on the whole bacterial cell detection are shown as excellent tools to investigate all the potential sources of risk. We would like to acknowledge the contribution of all members of the outbreak investigation team. We would like to thank to national authorities and Health Institutions for their assistance in the outbreak investigation. We would like to thank Biótica and especially Guillermo Rodríguez Albalat for always being available to answer any questions about the technical procedure of the immunomagnetic separation and the interpretation of its results during the outbreak and also for the speed and relevance of his answers and advice. We have no doubt that the resolution of this outbreak would have been more complicated without their collaboration. The study is funded by General Directorate of Public Health, Ministry of Health of the Council of Communities of Castilla - La Mancha. Employees at General Directorate of Public Health are responsible for management of study design, data collection, analysis and interpretation of data. JCM and FC drafted the manuscript and PJF critically reviewed the paper. JCM performed the environmental analysis and interpreted the results. JCM and FC were responsible for source tracing, environmental laboratory analysis and risk assessment, and PJF for typing clinical and environmental strains of Legionella. Recommendations of public health measures were discussed by FC, JCM and PJF. All authors read and approved the final version of the manuscript. Fernando Cebrián is biologist from the Universidad Complutense of Madrid, master’s degree in Health Management and Administration and a graduate diploma in Public Health from National School of Health, Carlos III Health Institute. He′s currently Head of Service of Environmental, Occupational and Public Health Laboratory, General Directorate of Public Health, Ministry of Health of the Council of Communities of Castilla - La Mancha, Spain. Appointed as National Expert by the Ministry of Health for the surveillance and control of Legionella, he’s collaborator of Spanish Society of Environmental Health. Cebrián has extensive knowledge on Legionella diagnosis, prevention and control on environmental samples as well as on Legionella outbreak investigation and management. He has conducted comparative studies on different methods (qPCR, immunomagnetic method and culture) to detect and quantify Legionella in water samples, and also on studies of efficacy of various disinfection methods to control Legionella in water systems at risk facilities.